Get down to an day of FREE traditional dancing, martial arts displays, delicious street food and kid-friendly activities; the Chinese New Year festivities are on. It’s the Year of the Pig so expect lots of colourful porcine-themed fun and spectacular performances on the specially constructed at Trafalgar Square. There’ll also be loads going on across the wider West End. 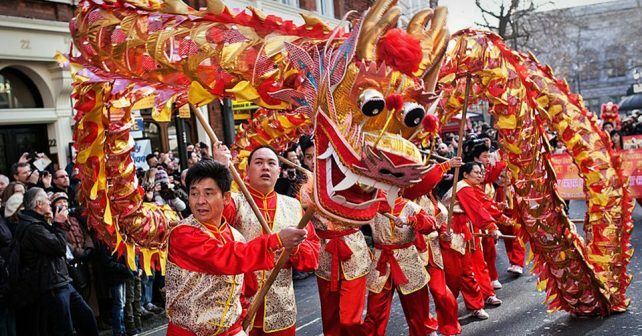 Watch out for floats down Charing Cross Road from 10am where there’l be lion dancers and a parade snaking through Chinatown to the Square. Look out for fun things outside the National Gallery too where kids can learn traditional calligraphy and try on Asian dress while they soak up the atmosphere. London at its best. Does your kid think they’re the next Beyonce, beatboxer or beatnik poet? Now they can prove it at the Brixton Youth Open Mic! 11-17-year-olds from all over the capital are all welcome to get up on stage and show what they’ve got. Organisers will be welcoming dancers, poets, comics, singers, musicians – whatever your offspring’s talent! Need to add to your kaftan, monocle or flapper dress collection? Course you do. Then head down to Frock Me! Vintage Fair in Chelsea. Watch out for classic clothes bargains from dozens of traders. The fair specialises in clothes from the 1900s onwards so some things are set to be pricey. But it’s amazing what you might pick up for under a tenner or less. How about a FREE (spooky) immersive gallery with a difference; The Walking Dead: Art Apocalypse is on in east London! The two day dead-a-thon at Old Truman Brewery will feature prop replicas from the cult show, fan art and your chance to join set re-enactments of some of your fave zombie scenes! It’s National Pizza Day and the Food Store is giving away FREE pizzas in Canary Wharf on Saturday.